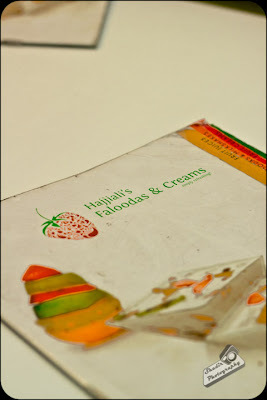 A sweet tooth craving and a need to hangout with friends, led to us to Hajjiali's outlet at North Boag Road. It was quarter past 11pm and the place was still buzzing with activity. Small children screaming and love birds cuddling, the place was alive. We walked up the winding staircase and sat in the corner and waited to place our orders. 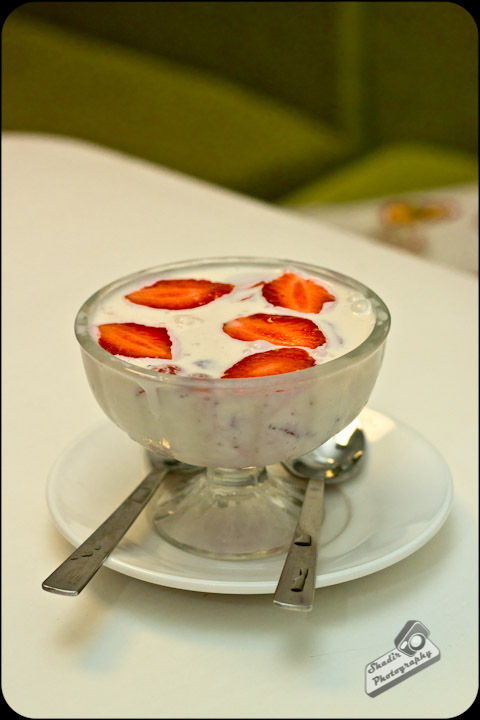 After a brief browse of the menu, we settled for Kesar Falooda and a Strawberry with Cream. Service was quick, with both the deserts arriving well under ten minutes. Cream & Strawberry was my clear favorite. The strawberry was fresh, cream was thick and sweet, combination blissful. I really would not mind having one more of these. The falooda which was served in a tall glass, with generous helping of tapioca, vermicelli, jelly and kesar ice cream. 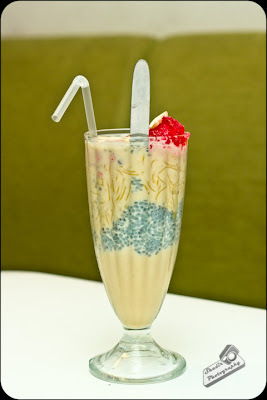 Looked fabulous, tasted great, but after having the strawberry with cream I just could not fall in love with the falooda. The ambiance is neat and pleasant. They should work to put out new cards, they look abused. The waiters are really patient and helpful. They answer our queries with a big smile even at 11pm. The overall bill for the two deserts was Rs 235/-, though slightly expensive, a very good experience and a good place to hangout. Hajjiali's is located on North Boag Road next to Cafe Coffee Day.